Have you ever imagined serving a beautiful puffed up golden brown cheese soufflé as a starter for your dinner party? I know I have for a long time but I was always reluctant to act upon my dream. I was afraid the soufflé would turn into a nightmare with a collapsed heap of sticky cheese sauce as a result. Until a close friend passed me her family soufflé recipe that is easy and guarantees success. You cannot go wrong and perfection of your cheese soufflé assured if you fill two conditions. The first condition is easy. You should never open the oven during the first 25 minutes while the soufflé is baking. The second condition is a little bit more complicated because it has to do with timing. You have to make sure that all your guests are seated at the table when you bring in the soufflé. About five minutes after you take a soufflé out of the oven it will start to collapse. In France you serve the aperitif (pre-dinner drinks) in a setting that is not around the dinner table. It can be in an entirely different room, for example the sitting room, or even in the garden on a nice summer evening. Invite your guests to sit down in comfortable chairs or on a sofa. I like to serve the aperitif while my guests are debout (standing). Especially if you have a larger group this last option gives everybody the opportunity to mix and mingle. About 5 minutes before your soufflé is ready give everybody a warning that dinner is served. In France the correct phrase to use is ‘Madame est servie’. This expression is a little old fashioned and was pronounced by the butler to announce dinner in the good old days. Nowadays most of us lack a butler but it is still a well-accepted phrase that all your French guests will understand. The moment you say these words everybody realizes that they need to end their conversation and head over to the dining room or dining table. At a more formal dinner party it is custom that the hostess assigns everybody a seat following a plan de table. ‘Le plan de table is made in advance and the hostess will either assign seats verbally or she will have put out name cards in advance. In France the host and hostess will take a seat in the centre of the table facing each other. The female guest of honour will sit on the right side of the host. The place reserved for the male guest of honour is on the right side of the hostess. On the left side of the hostess sits the second most important male guest. The second most important female guest finds her place on the left side of the host. Couples are always split up and will not sit next to each other unless they are engaged or have been married for less than a year. Younger people or guests that have been to your house many times before are placed near the end of the table. You can see the advantage of a round table here because it there will be no ‘bad’ seats. To complete your plan de table you need to alternate men and women, make sure the guests that will sit next to each other will get along and share the same interests and finally you need to mix the more timid guests among the more outgoing ones to make sure everybody will have a good time. In short making a plan de table is daunting and makes serving a soufflé a piece of cake in comparison. For an informal dinner party you don’t need to prepare a formal plan de table and you can let every one choose their own seats. I normally say where I’d like to sit because that makes it easier for me to pop into the kitchen every now and then to take care of the meal. 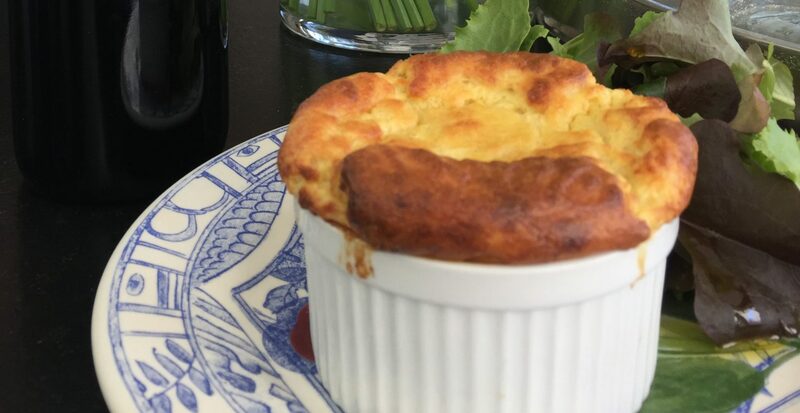 Once all your guests are properly seated and are served some wine it is the right moment to take your soufflé out of the oven and bring it into the dining room. A cheese soufflé is a rich and creamy dish. You can serve a brut champagne to accompany. If you prefer a red wine, a young and fruity wine will be a good option to balance out the richness of the soufflé. A second wine from a Bordeaux estate from a recent vintage like 2014 has supple tannins and fruitiness. And don’t worry: even if your soufflé collapses, it will still taste grandiose. Separate the egg yolks and whites. Continue by making a Béchamel sauce. First melt the butter in a pot with a thick bottom over a gentle heat. Once the butter is melted add all the flour at once and stir into a roux. Gently heat the mixture for 2 minutes so the flour will cook. Add the milk little by little while you stir until it is all absorbed and you have a nice thick sauce. Take the sauce of the heat and stir in the five egg yolks little by little until they are completely absorbed in the sauce. Mix in the grated cheeses and some pepper and nutmeg to taste. If you feel it is necessary you can add a little salt, but be careful because the cheese is salty as well. Butter the insides of a soufflé pan generously. You can use one large soufflé pan or small individual ones (ramequins). Up to here you can prepare the recipe several hours in advance. When you are ready to continue gently reheat the sauce while stirring until it is lukewarm. Whisk the egg whites with a pinch of salt into a firm mousse. This is easier done when your bowl and whisk are completely fat free. The whites need to be firm enough that you can turn the bowl upside down without the egg whites falling out. Stir about a quarter of the egg whites into the cheese sauce and mix well. Gently fold the remaining egg whites into the cheese béchamel sauce. Don’t over-stir at this stage because you want to keep in as much air as you can. Gently transfer the mixture to the soufflé dish and fill to about an inch under the brim. Place the soufflé in the middle of the hot oven for 30 to 35 minutes until the soufflé is well risen. Don’t open the oven for the first 25 minutes. Individual soufflés will be done in 25 minutes. Serve immediately with a simple green salad with vinaigrette on the side.